Mark Jackson does the improbable in his new Aurora Theatre Production. David Allen Alexander Crowther in Metamorphosis. In less capable hands, a stage version of Franz Kafka's Metamorphosis could easily have been a disaster. Really, think about it. The principal character wakes up one day and finds he's transformed, overnight, into a giant cockroach. 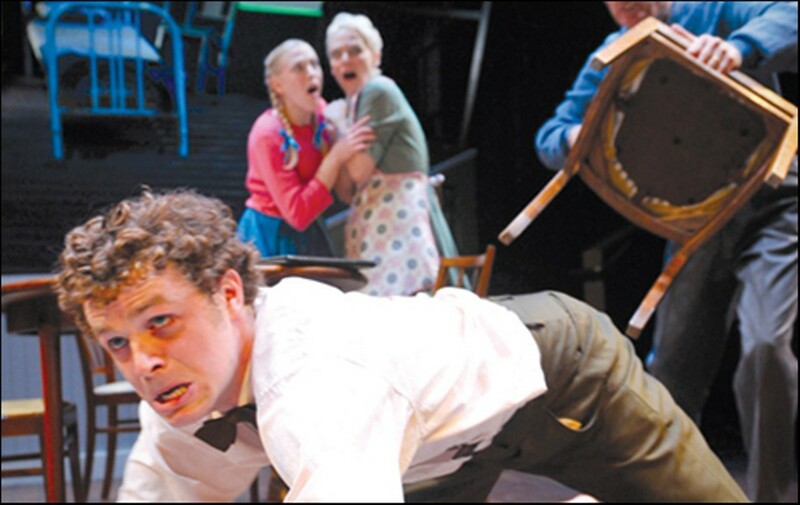 Or at least, everyone perceives him as a giant cockroach — he might have just symbolized a Jewish person living in early-twentieth century Germany, as literary manager Alicia Coombes suggests in the program notes to Aurora Theatre's current production. Either way, it's a nearly impossible thing to dramatize, lest the director risk losing a good portion of his audience. But no premise is too fraught for local theater director Mark Jackson, who dazzled audiences with his 2009 adaptation of Goethe's Faust, and went on to do a contemporized version of Mary Stuart, focused as much on national security as on the infamous Queen of Scotts (he produced both under the auspice of Shotgun Players). Jackson's version of Metamorphosis is several iterations removed from the 1915 German novella. He's working off a 2005 script by David Farr and Gísli Örn Gardarsson, who set their version during the Third Reich. But Jackson changed the setting to Cold War America — land of McCarthy witch hunts, nuclear arms races, and, as Jackson astutely points out, scary B-movies about bug invasions. Gregor's Mother (Madeline H.D. Brown) and sister Grete (Megan Trout) personify that environment with their taut smiles and pinched dialogue. Both bone-blond, they are as tightly wound as dolls in a music box. Gregor's father (Allen McKelvey) is a hardened layabout who exploits his children. Gregor, played fabulously by Alexander Crowther, is the lone innocent in the family. How to convey the metamorphosis from man to cockroach is a perplexing question. In this case, Jackson trusted his audience to know the basic contours of the story. He left Gregor in human form, but gave him all the attributes of an insect. Crowther has to scramble about his room like a giant bug, clawing furniture with his bare feet, crouching in corners to avoid being swatted by his sadistic father. He has the air of a diminutive, responsible human being, yet he's clearly paralyzed by this sudden unexplainable "condition." That's apparent from the moment Gregor is "discovered" by his family, who initially hear a violent shaking of floorboards as their insect-son moves about his bedroom. They're disgusted by Gregor, to the extent that they chase him away from the dining room, assault him with a newspaper, and ultimately try to starve him out. Gregor's father even smashes his son in a doorway. Gregor speaks in a normal human voice but when family members listen, they only hear garbled, growly insect sounds. 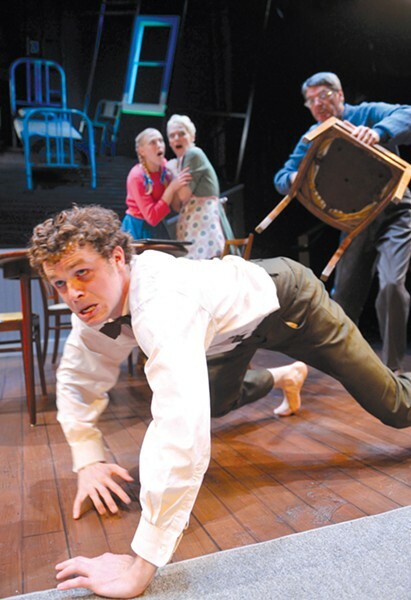 Sound designer Matthew Stines translates with a rough screech of violins, which also serve as a soundtrack for Gregor's movements as he skitters about the house. Improbably, Jackson turns this whole scenario into a sordid comedy. Indeed, there's something inherently funny about a human bug, and it's reflected in the way people react to Gregor — from the gruff employer Steitl (Patrick Jones) who berates him for "dereliction of duty," to the family members who recoil and call him a "thing." By far the funniest character is a prospective boarder named Herr Fischer (also played by Jones), who probably poses the greatest threat to Gregor's existence. Fischer swishes about the room, drumming his chest and appraising the whole house as though it were a piece of furniture. "I prefer my beef unadorned," he tells Gregor's father, juicing the line to exaggerate its carnal meaning. Such Freudian slips occur throughout Metamorphosis, as the clean, starchy, ruthlessly suburban family attempts to disappear Gregor, who was formerly the breadwinner. Jackson and set designer Nina Ball divide the stage in half, so that the downstairs is an Eisenhower-era living room and dining room, while the upstairs is Gregor's bedroom, where everything is askew. The bed tilts downward at a 45-degree angle, and the floor also serves as a back wall. At first Grete braves this strange, lopsided environment to visit Gregor and bring him leftover scraps from the dinner table. Over time, though, she shifts from benevolent captor to evil oppressor. When Herr Fischer arrives, Grete slips a hood over Gregor's head, to make him resemble a prisoner at Abu Ghraib. If anything, the crucifixion metaphors are more apparent in this play than in the original novella. But they're not gauche. Never one to underestimate the intelligence of his audience, Jackson refuses to bludgeon us with political or social subtexts. Nor does he allow the grave sadness of Kafka to completely saturate the play. Rather, there's a winking humor to each dialogue, and a kind of elasticity to the characters' movements that makes the whole thing seem light and buoyant — almost like a ballet. It's perhaps the best way to aestheticize one of the fluffiest periods in American history, when the veneer of social mobility helped mask an environment of anxiety and paranoia. Peel back one layer, though, and you'd find a cockroach underneath.